The discussion about the campaign of Jill Stein of the Green Party is the topic of my The National Interest piece. She has also become politically savvy, trying to appeal to disenfranchised Sanders voters who, especially after the leaks, feel that the DNC has betrayed them. She even went to the Democratic convention trying to directly reach some Sanders supporters. The surprise of the so-called “Demexit” even included people raising Jill Stein banners inside the DNC. Read the whole thing to know about these particular campaign different from others. A recent poll has shown libertarian nominee Gary Johnson at 13%. He, according to Matt Welch, could have more support than any Libertarian Party presidential candidate in the history of the party. The media, which is usually not interested in libertarians or any third-party candidate, had shown different side this year covering with enthusiasm the convention. Johnson and his vice presidential candidate William Weld had do a late night tour. So why these year. As pointed out by Justin Raimondo back in 2011, Johnson libertarianism is particularly moderate. 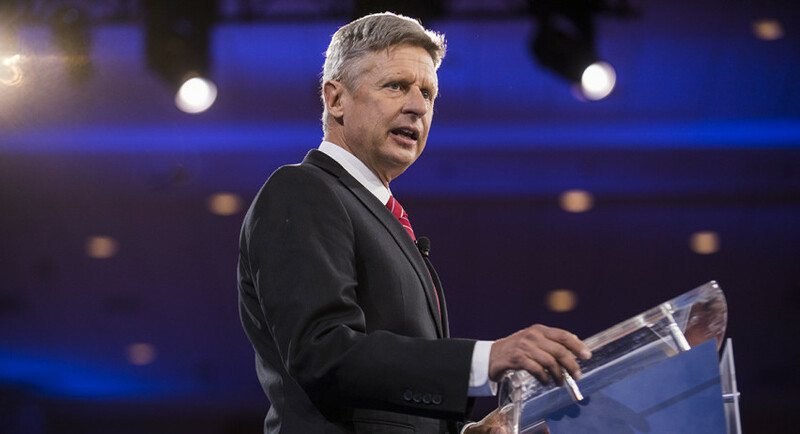 Though Johnson was by far the most moderate candidate in the Libertarian primaries, and he won was because of his tenure as governor of New Mexico, he was able to convince libertarians to choose William Weld as VP only by a tiny margin. If the radical libertarianism of Ron Paul became a subject of conversation in 2008 and 2012, why wouldn’t Johnson get the same treatment for 2016? The fact is that besides being a Reason reader and a broad promoter of libertarian ideas, he’s not as philosophical as Ron Paul. Johnson is antiwar, but doesn’t speak of withdrawing from NATO, a geopolitical move that has broad support among libertarians. He is for the “FairTax,” a tax reform measure that many libertarians oppose due to a philosophical objection to taxation in general. Ending the Fed, a cause made popular by Ron Paul, isn’t one of his priorities. I think William Weld is more intellectual than Johnson, though he is less of a libertarian and more of a hawk. But in an election featuring Hillary Clinton, the most neoconservative of all Democrats, and a divisive nativist like Donald Trump, Johnson looks like a good choice after all. He’s is promoting himself as a socially liberal and fiscal conservative with an executive experience like his VP. The problem is that his definition of libertarianism as fiscal conservativism and social liberalism excludes a lot of libertarians. Was Ron Paul a social liberal? Was Robert Anton Wilson a fiscal conservative? I think not. Is libertarianism is moderation, centrism? Even Goldwater sounded for a few moments more libertarian than Johnson. From the beginning, Justin Raimondo has said that the #NeverTrump crowd is happy with Johnson because they think he’s taking more votes from disaffected Republicans that would help elect Hillary. If not, how does someone such interest in his campaign from a liberal outlet like MSNBC make any sense? The media was largely hostile to Ron Paul, with The Young Turks and RT being among the few to treat him with respect. But the moderate ideas of Johnson like marijuana legalization are praised by liberal late-night hosts. And perhaps the really disturbing part of the Libertarian campaign that even Mitt Romney and Jeb Bush are considering vote for the LP, even though they represent the antithesis of libertarianism in most ways. The LP’s rise in the polls show that there is anger in the country against both parties and their presidential nominees. Thirteen percent is an unprecedented for a third party, and if the Libertarian candidate is able to reach 15%, is probable he will be in the debates but this is complicate because it need to be at that numbers in three national polls. On the one side this makes us think what would have happen if Ron Paul would have run as an LP candidate instead of Johnson. Back in 2012, Paul was polling 13% against an incumbent president popular with a liberal base and mainstream conservatives with establishment support, which makes me think that now he would be polling better than Johnson. Over the years, the Libertarian Party and the libertarian movement as a whole had a very nuanced question: would they push for reform or revolution? The reformist wing is usually more minarchist and Friedmanite, but sometimes people close to the Kochtopus could be radical Rothbardians. The revolutionary wing is diverse: it has anarcho-capitalists, left-libertarians and Ron Paul fans, with a major unifying for threat of these factions being that they don’t like compromise. For the moment the reformist wing is most visible thanks to Johnson, but it has problems. I’m sure Ron Paul could do it better than the former governor with millennials that probably now would vote for Jill Stein. On the other hand, the fact that Johnson doesn’t stand up for religious liberty is going to make him lose conservative votes. My advice to libertarians is that they should study the cases of this general election that’s often more polarizing someone like Ron Paul is better than Gary Johnson but in senatorial campaigns is often moderates not radicals who could win. Think of Rand Paul’s victory and Sean Haugh’s defeat in their respective bids for the Senate. Gary Johnson, at any rate, is almost certainly going to be the most voted libertarian in history. The libertarians face a difficult time with both parties becoming more hostile to the principles of liberty. But with the establishment in such a fragile state, maybe an insurgent campaign in 2020 could unite radicals and moderates toward a libertarian future.